dad's side of the family - hall, etc. I am in the process of converting the web pages to wiki so you may get some combination of old & new versions as you click around. table starts at the bottom and moves up the page. some charts are large; please be patient as they load. 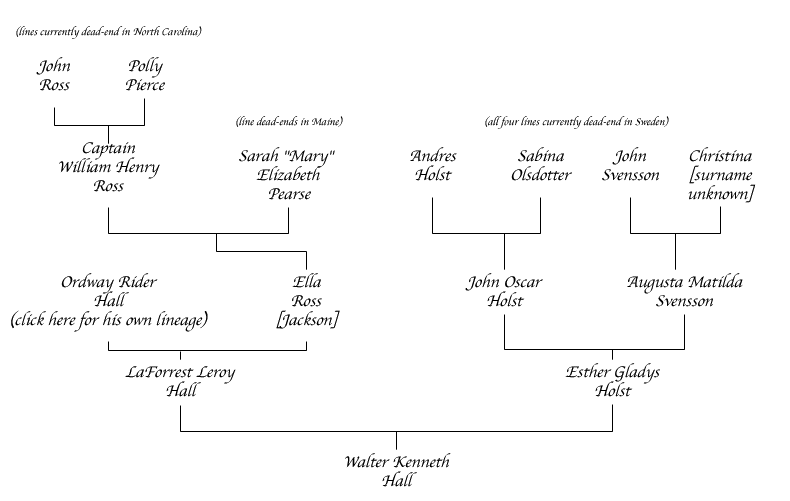 some links click to the family wiki pages, others - as marked - lead to further branches of the tree. the family is too big to put on one page. links will be made active as family information is posted. email comments, suggestions, fixes, requests for permission and general mischievious mayhem to the web diva (via dink -at- media -dot- mit -dot- edu). all the content on this page is copyrighted ©1992-2008 by Kristin C. Hall.